Back in 2017, our AR team designed and built a colour-changing interactive augmented reality sandbox and changed forever how we explain topography to children. Two years later, they have come back with Space Robotics’ “Augmented Reality Topography Sandbox 2.0”, a newer and improved versión of our original AR Sandbox. Augmented Reality (AR) is a set of new technologies that combine the real world with digital creations. In this new reality, we can include images or 3D figures in real objects, we can interact with digital elements that appear to be in the real world or interact with real elements and obtain a digital response. That last option is what we used to create our augmented reality topography map. We use a big box filled with special sand to recreate the surface we want to study. The students can interact with the sand and build whatever landscape or geological formation they want to. Meanwhile, a millimetrically adjusted 3D sensor monitors the sandbox and sends all the data to a powerful portable computer. A Unix-based simulation-software is then in-charged of creating a 3D model of the surface created in the box. Another program paints the 3D model with layers of different colours and creates a 2D image that is sent to a projector. Finally, a few milliseconds after the process started, the image is projected in the sandbox, which turns into a responsive interactive 3D topography map that displays different colours at different heights. Moreover, after further development, we have been able to recreate how water would behave on that surface. For the 2.0 version, we have used open-source CAD software to design a much bigger and tough sandbox and built it out of anodized aluminium profiles and chipboard panels. Now, more kids may use it at the same time. We also took the opportunity to revise and improve the whole software and finally we choose a brighter projector. 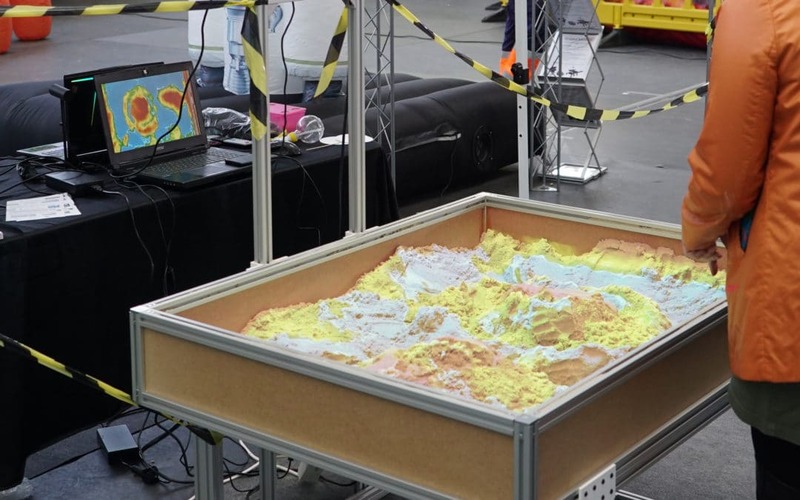 The result: an improved AR SandBox that wherever it goes, makes students from different ages have fun while they learn about topographic maps and simulate different geographic formations with their own bare hands.